Whitney Wagoner fell asleep in her seat at the Super Bowl. Twice. Super Bowl LII airs Feb. 4 on NBC. In a Jan. 24 Quack Chats pub talk, “Super Bowl unveiled: Behind the business of the big game,” Wagoner will talk about why the pinnacle of sports entertainment in the United States, with the exception of the halftime show, falls flat when it comes to fan experiences. 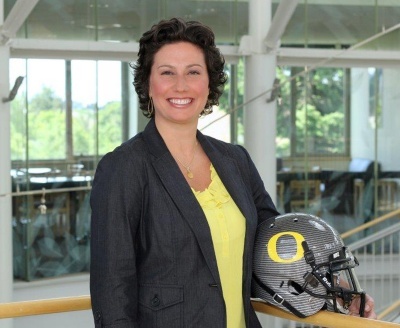 The Jan. 24 talk begins at 6 p.m. at the Ax Billy Grill at the Downtown Athletic Club, 999 Willamette St., in Eugene. The public is invited. Admission is free and questions are encouraged. Food and drinks will be available for purchase. She said everything about the Super Bowl — from the broadcast to the ads to the in-person experience — is designed for the sponsors, media and other business partners. Wagoner will break down the media aspect of the game and explain ratings and ad sales. Wagoner graduated from the Lundquist College of Business in 1996. Jim Warsaw, namesake of the Warsaw Sports Marketing Center, helped her land an unpaid internship with the National Football League. She left for New York two weeks after graduation. She worked in the corporate sponsorship department the entire time and had a front-row, backstage pass to what the Super Bowl is from the business perspective. She returned to the UO in January 2004 and took the helm of the Warsaw Center in 2015. In her talk, she will dive in to how the Super Bowl transcends sport and what to look for as NBC uses the game to promote the Winter Olympics. The games begin five days later on the network. For information about Quack Chats and to sign up for advance-notification emails, see http://uoregon.edu/quackchats. Stories about upcoming talks are posted in the Quack Chats section of Around the O about one week before each event.